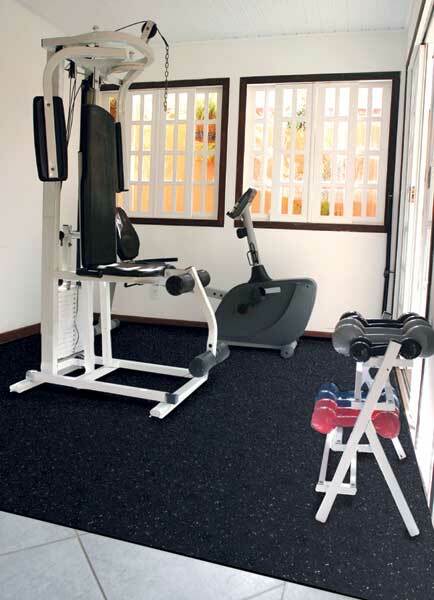 Our Sports Flooring interlocking rubber floor tiles offer excellent performance, durability, appearance and easy installation making it the ideal rubber flooring for home gyms (utility rooms, garage floors, work benches, and anywhere else you need protective flooring). 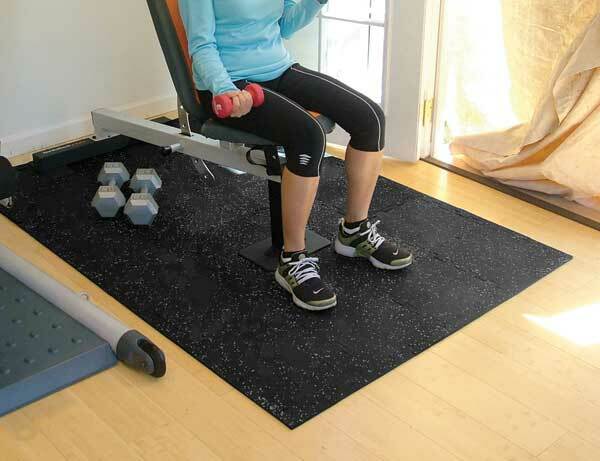 The non-slip rubber tile surface is easy to clean and maintain, and will be your gym flooring solution for many years to come. These 12"x12"x3/8" eco-friendly recycled rubber floor tiles are manufactured in the USA from scrap tires. Each tile is 12"x12"x3/8" and comes with borders. Made of 96% Recycled Rubber tires. Indoor cleaning involves a broom, damp sponge, mop or vacuum cleaner. For outdoor use, a water hose, leaf blower or broom is sufficient. 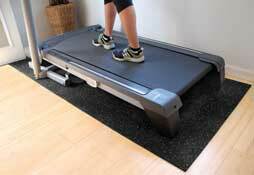 Keep in mind, rubber mats have a "rubber" odor that will diminish over time. Durable and easily assembles in minutes. 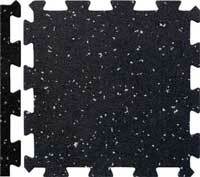 Rubber tiles may be easily trimmed for custom shapes and sizes. 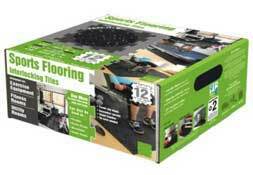 One box can make a 3'x4' mat size, ideal for stepper and exercise bikes. Two boxes can make a 3'x5', 3'x6', 3'x7', 3'x8' or a wider 4'x4', 4'x5', or a 4'x6' mat size, ideal as a large treadmill mat, elliptical trainer mat, fitness machine mat, and/or a weight bench mat. 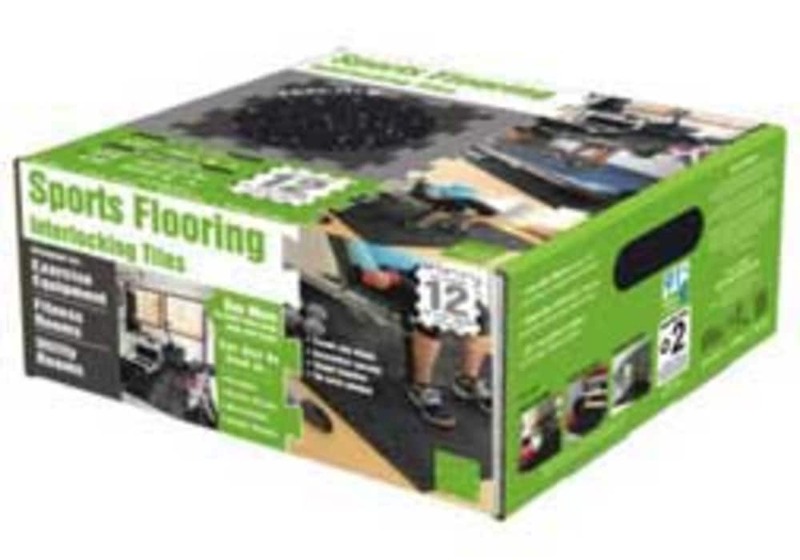 Add more boxes to create an entire rubber gym floor. 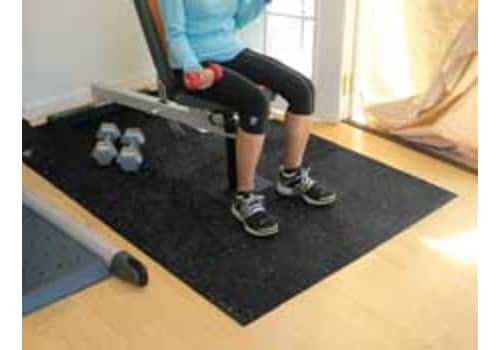 Sports Flooring interlocking rubber flooring can be installed easily over nearly any smooth surface including concrete, asphalt, wood or tile. No special tools are required. 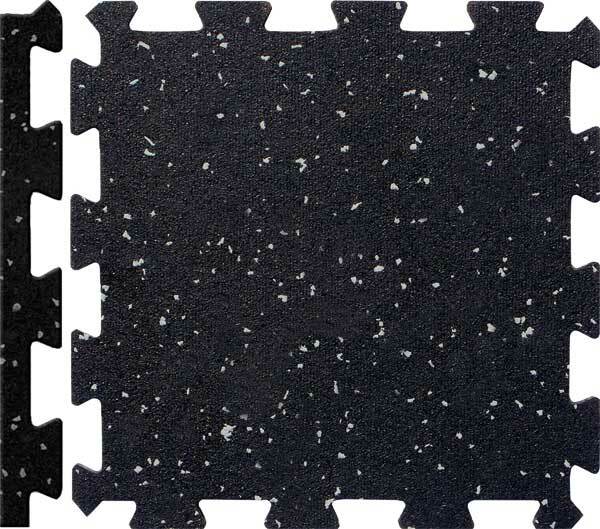 The unique tab design holds the tiles together securely without the need of expensive adhesives, tapes or the labor to apply them. Installation is as easy as aligning the tabs and pressing together with your fingers or using a rubber mallet. 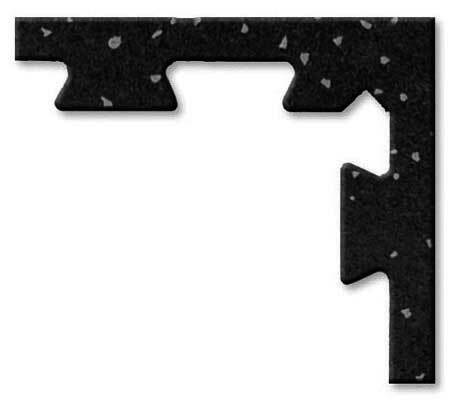 The unique tab design allows for a square or brick installation pattern. These interlocking rubber floor tiles can also be disassembled and reassembled repeatedly without damaging them. 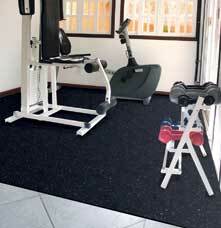 For larger coverage areas, we also carry Tuff-N-Easy Rubber Floor Tiles and rolled rubber flooring.